We’re excited to announce our first DC event, Putting Peace First: 7 Commitments to Change the World, in collaboration with Peace First, Swedenborg Center, and FaithJustice Foundation. Join us at Church of the Holy City on January 29 at 6:30 pm to talk about how DC faith communities can support young people to change our city. For 25 years, Peace First has been helping young people change the world. 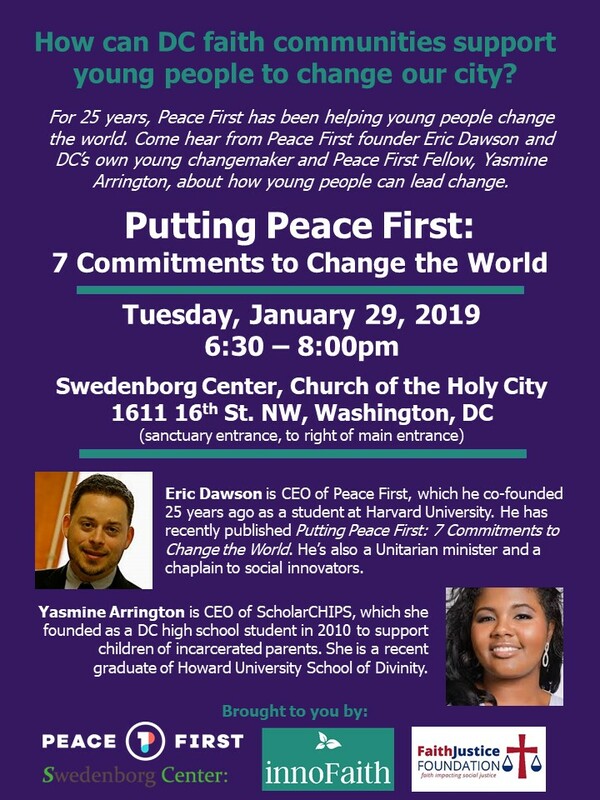 Come hear from Peace First founder Eric Dawson and DC’s own young changemaker and Peace First Fellow Yasmine Arrington about how young people can lead change. Register via the link below. And help us spread the word through our Facebook event page.